Join the discussion on our forums! 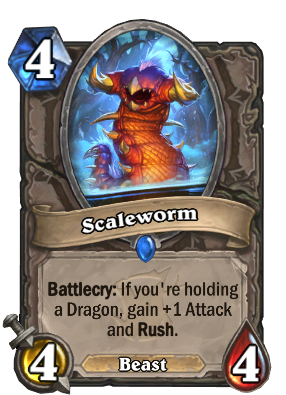 Come discuss Scaleworm over in our dedicated Scaleworm discussion topic. Battlecry: If you're holding a Dragon, gain +1 Attack and Rush. A popular local alternative to bananas. Looks like it has found home in spitefull druid! Marsh Drake and Scaleworm also both trigger Jungle Giants, Scaleworm when its effect goes off though. is it because of the Beast Tag and Emeriss!? Losing a few of the Dragon synergies with rotation, so we need a few to replace them. Sadly this seems a little sub-par. Does this work for jungle giants as long as you meet the condition? Could be pretty useful for completing that quest. It does work with the quest but i dont see that helping out the quest that much to the point in where its not still horrendously slow. if you are holding a dragon, this is a beast. Even if you're not holding a dragon it's a beast. It's okay. We're losing a lot of good dragon synergy cards when Mammoth sets rotate out so some cards need to fill that void. Most unexciting card of the set. To my knowledge Rexxar isnt updated with new beasts from the new sets. You knowledge is not up to date. Blizzard officially said that in witchwood they will update Deathstalker Rexxar hero power. So sad, that The Curator moves to wild. Strong card for Dragon Priest in standard. Should see plenty of play. In standard Dragon Priest is losing Drakonid Operative, Dragonfire Potion, Netherspite Historian, Wrathion (not that anyone ran it), and The Curator. I don't think Dragon Priest will survive in standard for this card to see play.